This can was a can of Del Monte fruit. It can be done with ANY can that has a pop top opening. those squatty pineapple cans are darling for this! 1. Open the can from the bottom with a safety can opener. A safety can opener allows you to have the entire lid without it being sharp. You can't do this with a regular can opener. 2. Eat the contents. Wash and dry the can & lid. 3. 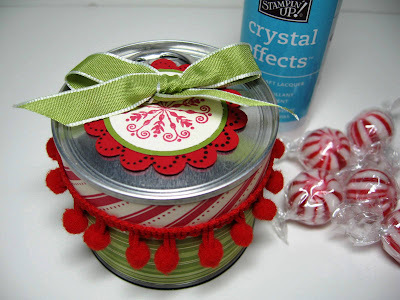 Stuff the gift in the can. If using food or candy that is unwrapped, I suggest you put it in a bag. I don't know that the can and Crystal Effects will hurt you, but why take that chance?! 4. 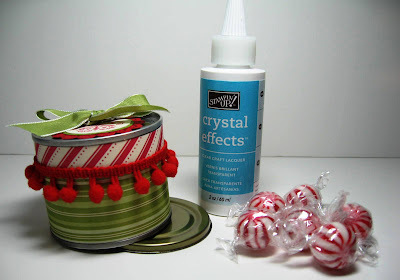 Add little drops of Crystal Effects to the rim of the lid and place onto the can. Turn right side up and set something heavy (like a book) on it for about 5 minutes until dry. How darling is this?? Someone special gave this to me at my Open House. She said she got the idea from BFF's blog! Thank you!! That is most adorable rudolph I have seen in a long time :)..very cute!! They are adorable cans! 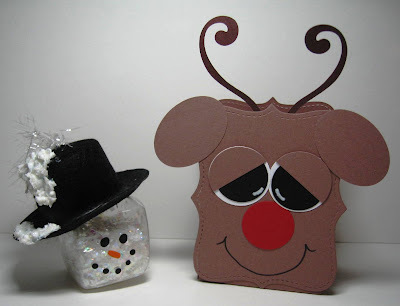 Love the little snowman and reindeer too! This is a super cool idea, thanks heaps for sharing it! I cant wait to have a go! Too cute - the reindeer is adorable! And thx for the reminder about the fruit can. May be an oldie, but definitely a goodie!